Ram and Sita’s shubh Vivaah happened and then Sita’s bidaai. Ram-Sita reach Ayodhya in a beautiful grand cart, along with the other couples. Dasharath ad his queens, along with Ayodhya Praja happily welcome the four newlywed couples. Sita is very happy to see her inlaws. Sita and her sisters greet their mothers in law. They get very happy seeing entire Ayodhya welcoming them by showering flowers and immense love. Dasharath is also happy seeing all his four sons and vadhus. The Raghukul vadhus are welcomed by Dasharath and his three queens. Dasharath tells Kaikeyi about Ayodhya’s future king Ram, which makes Kaikeyi upset. Kaikeyi looks at Manthara. Dasharath happily cries seeing this moment of his sons and vadhus. Now the show will bring the vanvaas track. Ram and Sita will be accepting the vanvaas, as proposed by Kaikeyi. The family, relations, throne, Rajya, and all luxuries will be left behind. Ram and Sita are preparing for Van-daman. Laxman will be accompanying Ram and Sita in the van-daman. 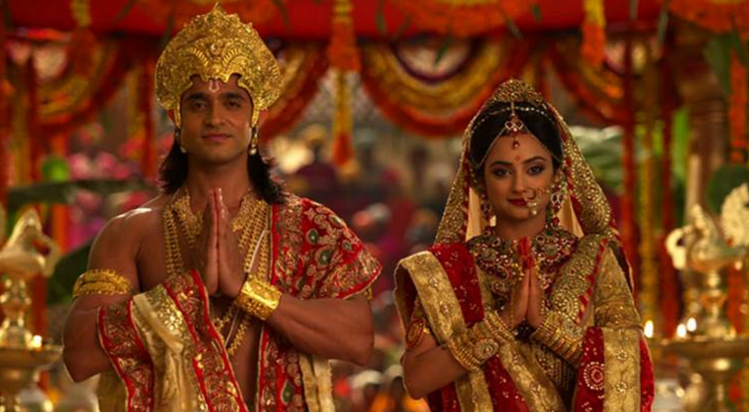 Ram-Sita and Laxman sadly leave from Ayodhya’s palace. Thanks a lot for skr spoilers……….